In TX Text Control Server for ASP.NET (incl. 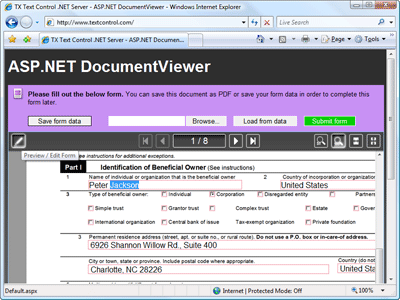 Windows Forms) 15.0, we introduced the ASP.NET DocumentViewer. The DocumentViewer is a completely new server component in TX Text Control 15.0. It provides a very easy way to display the contents of a document, edit a template's form fields and to navigate around a document within a web browser. We just published a new live sample to our demo server that shows how to use the ASP.NET DocumentViewer to fill out forms. The ASP.NET DocumentViewer implements two edit modes: ReadOnly and Edit. The ReadOnly mode can be used to display all supported documents in an ASP.NET web site. You are able to navigate through all pages, as well as change the zoom factor. The ASP.NET DocumentViewer's API can be also used to load a document, set the current page number or to change the zoom factor. This enables you to create your own user interface, for example by providing your own tool or navigation-bar. Internally, the DocumentViewer is based on the newly introduced Page Rendering Engine of TX Text Control Server for ASP.NET (incl. Windows Forms) which creates high quality, scalable images of each page of the document. The new live demo shows a typical work-flow of a form. The form (in our case a US tax form) will be displayed to the user in the DocumentViewer. The form is an MS Word DOCX file including MS Word form fields of type FormText, FormDropDown and FormCheckBox. This being the case, you can use your legacy MS Word form templates with this new ASP.NET component. The user is able to complete the form and click 'Submit form' to create a print-ready PDF server-side. Additionally, data that has already been added to the form can be saved as an XML data file on the local machine in order to complete the document later.